Whether you’re looking for a routine that fits into your daily life, or you just need a little more accountability to keep you motivated - you’ve found it with No Boundaries. We provide different training plans for walking, interval running, and running so there is a group to fit your level. Each coached group workout will include some circuit training (with modifications as needed) and stretching to help you get stronger and prevent injuries. Choose walk, run/walk, or run when you register and we can always adjust it during the program. Info Session: Wed Aug 30 – Fleet Feet Sports Sun Prairie. 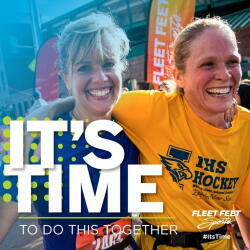 Come into Fleet Feet at 7:15pm to have any of your fall training program questions answered before you register! A coach will be on site to go over training program logistics and information. *Race entry is not included in the training program registration. If you are not able to participate in Run, Santa, Run, we can help you find another 5K. Program Kick-Off Party: Saturday, September 9, 2017 at Fleet Feet Sun Prairie at 8:30am. This first meeting will be informational. We will run through safety concerns, program details, and discuss tools to ensure you have a successful season. We will also go over proper form when running and walking. This is also an excellent opportunity to introduce you to our coaching and mentoring staff. The kick-off will typically last 45 min – 1 hr. We will NOT be running/walking this day. First Group Workout: Wednesday, September 13 @ 6pm at either Fleet Feet Sports location. Meeting Times & Locations: We will have 2 separate meeting locations on Wednesday evenings (EAST and WEST locations), Saturdays @ 8am: Vilas Zoo parking lot at the corner of Vilas Park Drive and Orchard Hill. A complete 12-week training program for walkers, run/walkers, and runners. Options based on goals and experience. No matter your pace, there is a place for you! Seminar series to prepare new runners/walkers with knowledge of Good Form Running, injury prevention, massage, strength and nutrition. Description: The training program from Fleet Feet Sports Madison & Sun Prairie only requires you to run or walk 3x/week ? 2x with us! You can commit to this training plan even with a busy schedule!